Home » New Stuff » Essays » It’s all in your head. Or on it. That’s what Ann responded after I’d asked whether I needed to wear a head covering in her shul for her daughter Gavriella’s bat mitzvah. Ann and her husband, James, belong to the Bayit, a very progressive but nonetheless Orthodox congregation in Riverdale, founded by the activist rabbi, Avi Weiss. I, on the other hand, belong to New City Jewish Center, a Conservative egalitarian congregation in Rockland County, and head covering is definitely not a thing. But since I was going to be a visitor, I felt I should abide by the custom of the community. Ann would be wearing a super-chic fascinator. Her mom, a huge hat; her sister, probably a doily. The cousin? Maybe a sheitel. And there would be married women with nothing on their heads at all. In short, it wasn’t going to look that much different, at least as far as a milliner would be concerned, than my own synagogue. Still, I wasn’t quite convinced. After all, I was going to be attending a simcha. I get it. Our customs are different. At the Bayit, there’s a mechitza—a center-aisle division, in this case—between the men’s and women’s sides of the shul. The service would be a women’s tefillah, to which men were invited, but it would not be considered a minyan. So we would not be doing the parts of the service that in Orthodoxy require 10 adult males to be present. Ann felt I should be comfortable davening the way that I usually do. If that meant wearing kippah, tallit and tefillin, as I do, for the weekday service, so be it. But I wasn’t sure. While I am used to being one of only a few women who don tallit, and even fewer who lay tefillin, I didn’t feel like I needed to make any bold statements—hey, I’m loud, proud and egal—at someone else’s simcha. I’m long past feeling any need to be an iconoclast. But the Sunday morning of the service rolled around and I was toting my tallit and tefillin into the women’s section of the Bayit, while my husband went off to the men’s section to sit with friends. I scouted one woman with a tallit. Maybe one with or two with kippot. No tefillin, at least not on the women’s side. But, hey, I’m in for a penny, in for a pound. I donned the full regalia. The service was beautiful. The bat mitzvah girl did a great job leading the service, singing with confidence and poise. We danced around the section to celebrate at the end, broke for a light collation and regrouped, this time sitting in whichever section we wanted, to hear the speeches. And the amazing thing about my kippah, tallit and tefillin? Not a thing. I have to give credit to Rabbi Weiss—who stepped back from his duties as head rabbi in July—and his congregants. In an era when inclusive is a buzzword, they have really tried to live it. Admittedly, it still seems odd to me that in the service women could do so much and be so integral, and yet still not count as part of a minyan. But Open Orthodoxy is persistently and honestly grappling with ways to halachically come to terms with the fact that educated women, passionate about their Judaism, need to be included from the ground up, all the way through leadership. Weiss has come under criticism for this stance. Several years ago, he conferred the status of the first rabba on Sara Hurwitz, who continues to serve as a spiritual advisor in the shul. A rabba is a spiritual leader, not unlike a a rabbi. 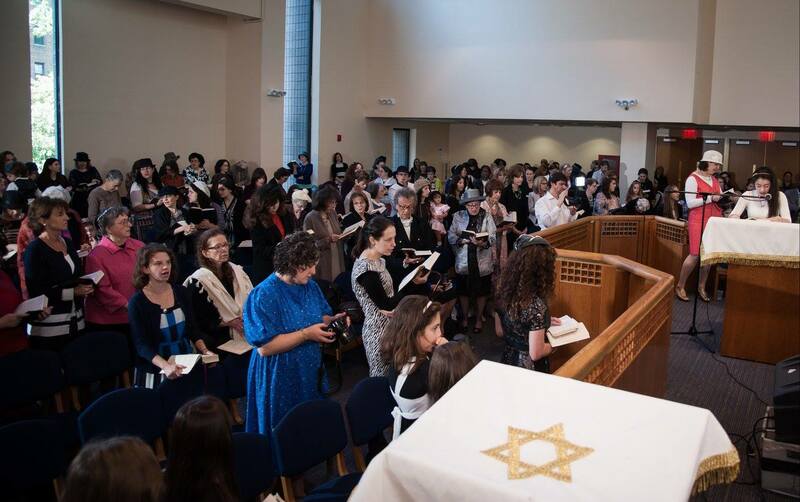 There was a firestorm of protest, and media coverage, but Weiss went on to found Yeshivat Maharat, which boldly states that it is the first yeshiva to ordain women as Orthodox clergy. Maharat is an acronym meaning female spiritual, legal and Torah leader. In late October, the Rabbinical Council of America (RCA), Modern Orthodoxy’s main professional rabbinical organization, came out squarely against ordaining women. The pushback, which is not exactly surprising, is aimed squarely at Weiss and his maharats. In many ways, the decision validates what exists by taking aim at it. Simply put: There are Orthodox women clergy—call them what you want—advising congregants, leading services, reading Torah, making halachic rulings, doing in short, the work that men have long done as rabbis. The horse probably left the barn long ago, maybe when Bais Yaakov schools were founded in 1917 to educate Jewish girls in their own religion to provide an alternative to the public schools and their secular influence. Prior to that, girls received little formal education in Judaism. But once you learn, you want to know more. Over time many modern Orthodox women were given educations on a par with that of men. And now, nearly 100 years after the first Bais Yaakov came to be in Poland, the result is a generation of Jewish Orthodox women who have been raised by mothers fully educated, conversant in Jewish law and grounded in well-beyond-the-basics of the religion. As for upsetting anyone? I don’t think I managed it in the least. And that is probably good for the health of Judaism. Sounds like such a lovely service! And how marvelous to feel so welcome and comfortable in a house of worship not your “own.” I do hope you’ll go back.